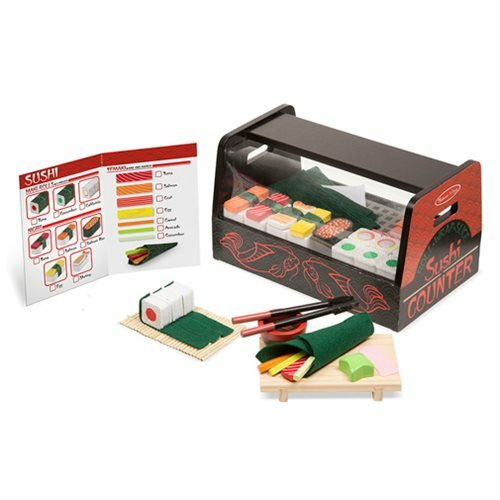 Budding young sushi chefs can practice their rolling, wrapping, and slicing skills with this 56-piece wooden Roll, Wrap, and Slice Sushi Counter Playset that includes a tabletop display / serving counter that holds all the ingredients for making maki rolls, nigiri, and temaki. Lay the wooden sushi pieces on the felt nori strips, stick them together with the self-stick tabs, roll with the sushi mat, and then slice and serve with ginger, wasabi, and soy sauce! Order on the reusable menu/information/instruction card and pick up the pieces with chop sticks. Ages 3 and up.